On 14 March the annual International Day of Action for Rivers was celebrated all over the world. This day coincided with the second anniversary of the Save the Tigris campaign, which was founded in 2012. 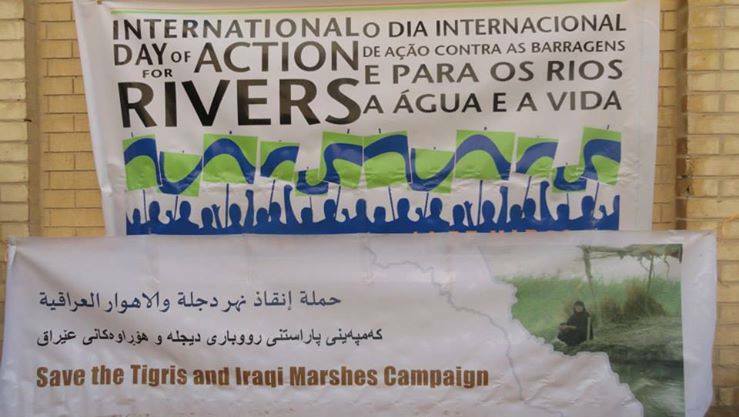 In the wake of the International Day of Action for Rivers 2014, the campaign set up two events in Iraq, under the banner of “Stop Ilisu Dam, stop the disaster”. 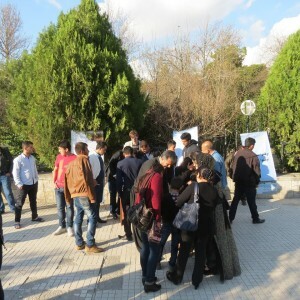 One on 14 March in Baghdad, and on 16 March in Sulaymaniyah to raise awareness about the Ilisu dam, which is currently still under construction in Turkey, and the dangers that it poses to Iraq’s water resources, culture and environment. Over the world, people took part in over 90 actions in the week of 14 March to demonstrate the critical and urgent need to protect rivers and defend people’s livelihoods from destructive big dams. In Turkey, the Euphrates River has been dammed extensively and as a consequence, the water entering Iraq has been reduced to 80% of its flow. Now a similar damming scheme will follow on the Tigris River. The Ilisu dam is the first of a series of big dams planned on the Tigris. In Baghdad, the Save the Tigris Campaign was present in Al Mutannabi Street with several large banners, distributing a statement in Arabic to pass-byers. The statement informed people about the threat posed by the Ilisu dam, and called upon them to visit our website and to support the campaign. In Sulaymaniyah, near the Suleimani Palace, the same statement was spread in Kurdish, in the forefront of large campaign banners. Following the International Day of Action for Rivers, the United Nation’s World Water Day will take place on 22 March. On this occasion the Save the Tigris Campaign in cooperation with the Iraqi Social Forum will be holding a conference in Baghdad to discuss Iraq’s national water policies, and in particular the Ilisu Dam threat. The conference “Saving the Tigris your duty, and mine” will be held with the support of the Baghdad Provincial Council in the Baghdad International Hotel.